What do you do when your guitar playing starts to sound sloppy at faster speeds? “Practice very slowly, fix your mistakes at slow speeds and gradually start playing faster”. ...but it’s not enough to help you master guitar technique. 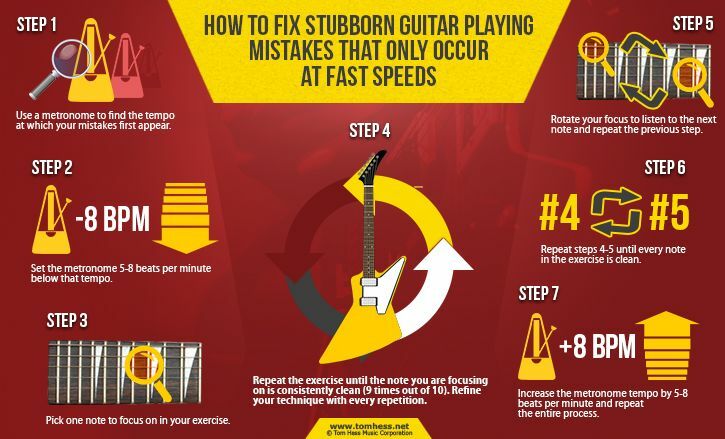 Many of your guitar playing mistakes only show up near your top speed. At slow tempos, these mistakes disappear and become impossible to fix. Slow practice isn't always the answer. This free sweep picking eGuide shows 5 more guitar practice strategies that help you play guitar fast and clean. Step 1: Find the exact metronome tempo at which your mistakes first appear. Write down this tempo and keep track of it. As your playing improves, this metronome speed will get higher and higher. Step 2: Set the metronome 5-8 beats per minute below that tempo. Step 3: Pick one note to focus on in your exercise, as shown in the video. Let the other notes go by on autopilot. Do not worry if you make mistakes on the other notes! Stay focused only on the one note you should listen for (more on this below). Step 4: Repeat the exercise over and over until the note you are focusing on is consistently clean (9 times out of 10). Refine your technique with every repetition. Step 5: Rotate your focus to listen to the next note and repeat the previous step. At this point, you let the previous note you focused on go on autopilot. Focus only on the new note you should be listening for. Analyze your technique and make sure it is perfect. Step 6: Repeat steps 4-5 until every note in the exercise is clean. Step 7: Increase the metronome tempo by 5-8 beats per minute and repeat the entire process. Tip: Occasionally practice these steps with your guitar unplugged. This forces you to listen more carefully and refines your 2-hand synchronization to a much higher level. Isolate 3-4 notes from your practice item and repeat them over and over at a fast tempo (near your top speed). Pick one note to listen for and focus on it like a laser. Reducing the number of notes helps you do this more easily. Gradually extend the isolated excerpt (one note at a time) until you are playing the entire exercise. Over time you learn to hear notes just as fast as you can play them. This is key to playing guitar fast and clean. Articulate the note you are listening for with more power. This makes it easier to hear if the note is clean or not. Every time your focus shifts to a new note in the exercise, articulate that new note harder with the pick. Important: keep the rhythm of the exercise the same! Don’t make the accented note last longer (or shorter) than the other notes. Jake Melling, president of the American Academy Of Guitar Mastery says: "guitar lessons for improving your speed should always involve speed bursts". Speed bursts make it easy to focus on each note of your exercise as you play near your top speed. You play a fast flurry of notes, stop (rest) for 1-2 seconds, repeat the burst, stop again and repeat over and over. The silence between each speed burst is very important. It allows your mind to replay the notes in your head and identify mistakes more easily. As you repeat the speed burst, make the adjustments needed to articulate the notes better. You are able to practice at much faster tempos than the speeds at which you normally play. This makes fast guitar playing feel easier. Speed bursts also help you relax excess tension in your body. The brief rest between bursts makes you aware of excess tension and gives you time to relax. This trains you to play guitar consistently without mistakes and makes your technique feel easier. Apply these practice methods to fix persistent mistakes in your guitar playing that happen at fast speeds. This makes your guitar playing more consistent and reliable and helps you have more fun making music. This free eBook about sweep picking shows you 5 more ways to make your guitar technique faster and cleaner. Become a better guitarist fast by signing up for electric guitar tuition online.